Let’s enrich your consumption by giving it a social value! Hong Kong first SE Directory mobile application and one-stop information platform has been revamped to better serve the general public and different public or private units for accessing information of local social enterprises (SEs) anytime, anywhere. The SE Directory mobile application is tailor-made for users to search for SE products and services according to their personal preferences and purchase objectives, as well as to obtain up-to-date SE information. Promptly search for your favorite SEs by simply typing in keywords or selecting the categories of "Business Nature", "District” and/or “Social Mission"
SE webpages in the application can connect to the real-time Global Positioning System map , so that you can easily acquire directions to any SEs. 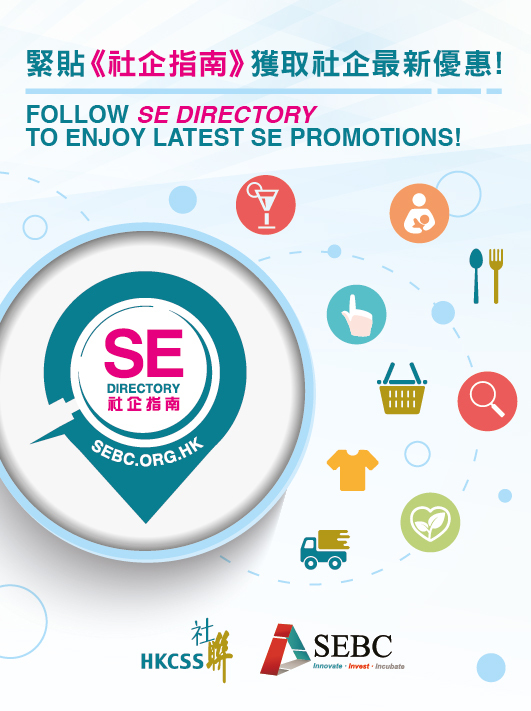 Download the SE Directory mobile application now and make your spending more meaningful and rewarding!